Do I have to follow this styling guide? Icons are user uploaded images that are used throughout the site to represent a game. Due to their prominence on game and user pages they are worth special attention. When designing a new game icon consider the following: Much of the community prefers that game Icons use art assets that were made for the original game; - from inside the game, - or for the game documents, - or for the game manual, - or for promotional material, - and so on; art created by the original team. Using more current designs (or fan art) for classic video game characters might be seem appealing. But many find this is disrespectful to the source material. For unlicensed games or ~hacks~ where there is little original art available non-official art might be reasonable. Making modifications to the art assets available for would usually be reasonable. Using outside or hand-made assets, say for a title or border, would be reasonable so long as the main subject uses official art. The style you choose for your designs is still up to you. You can break these rules so long as you do not break any copyright law, or upload anything vulgar, offensive or pornographic. Browse the games list, to find Icons that speak to you. Mimic and innovate on the style of your favorites. Many of the Badge creation tips apply here as well. Uploaded Icons should be square (have the same X and Y dimensions), otherwise the resulting image will be distorted and ugly. Upload using non-interlaced PNG format; avoid using a transparency layer as it will come out in the end with a flat white box. Design images at 96x96 (preferred), 64x64, 48x48 or 32x32 for sharpest clarity. Icons and badges should be made in a way that the subject is clear even when sized at 32x32 as they are often reduced to this size, like on the global feed. 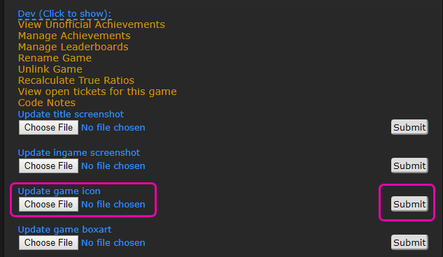 Achievement Developers are allowed to change game Icons freely for entries that do not have achievements. As a Developer if you'd like to post a backup of the previous image there, if there is one, or backup yours in the forum you're free to but not required. As you create a new set of achievement you are free to create or choose the image you'd like to use as the game Icon. If a game has existing achievements game Icon changes need to go through the Icon Gauntlet. Yes you absolutely can, but read the rules for the Icon Gauntlet. It will also be good to review the guidelines for designing new game Icons. The game Icon Gauntlet pits a user posted new Icon in a head-to-head fight with the standing Icon. The popular vote which will take place in the #Icon-Gauntlet Discord channel and will determine which stays and which goes. All verified Discord users are eligible to cast their deciding vote. Spawncalibur is the manager of all aspects of this on ongoing contest. Any verified RetroAchievments user can submit a new game Icon. Only submit Icons for games that have existing achievements. Icon submissions must be related to the game, no lewd graphics. Recommended: Icons are best created at 96x96, 64x64 or 32x32. Create PNG image files for best quality. Post them in this forum topic. The vote takes place in the #Icon-Gauntlet Discord channel and open is to all Verified (green name) Discord users. New votes are posted weekly and the vote lasts for the week. If tie happens there will be a revote. When uploaded, your Icon images are reduced to a maximum 96x96 32-bit colour PNG. If you upload an Icon that is smaller than 96x96 the image uploaded will retain its original size. Icons are stored on the site in the following manner and place: i.retroachievements.org/Images/000705.png. They are stored in the same server folder as other game images such as the game box and game screenshots. Badges are the user created images for individual achievements of a game. Badges should refer in some way to what the achievement is about - i.e. a picture of the boss, level or collectible that the achievement requires the player to get to. Here's a forum topic full of great tips. In the cases of low-resolution games' achievements, it can be hard to get a Badge looking good without it looking blocky or blurry, in these cases the blocky look is often preferable, so that the images have a retro feel to them. You can make each Badge have little rounded borders like an actual Badge or some extra spiky corners for emphasis or a king's crown for difficult ones. Its your design. It should visually represent the achievement itself, or hint at the location in the game for secrets. Matching to the game's art style works well. Google Image searches for "Sprite Sheets" is another useful tip to include some game art. Uploaded Badges should be square (have the same X and Y dimensions), otherwise the resulting image will be distorted and ugly. Design images at 64x64, 48x48 or 32x32 for sharpest clarity. Badges should be made in a way that the subject is clear even when sized at 32x32, as they are often reduced to this size, like on the global feed. If you are creating new achievements you are free to upload badges for them. Upload .jpg, .jpg or .gif file types. It's not entirely important how the file is formatted before uploading, but it is strongly recommended that it be square. If the game has existing badges review and follow the procedure for Uploading Badges (Non-Developer). Post all the new images you'd like to replace current ones in the forum topic for that game. Also list which Badges they meant to replace. A developer or mod will review your work and decide if they are to be replaced. If so they will post a backup of the current Icons in the forum game topic, and replace the existing ones. This backup is necessary in cases where there are disagreements about the new Badges. In some cases some or all of the new Badges will be reverted to the old. It's easiest to just reference the old and new Badges as img links: - example: [img=https://retroachievements.org/Badge/01234.png] -> [img=https://retroachievements.org/badge/56789.png] - (Dev) make sure to capture the old Badge ID from the Achievement Editor before uploading the new Badge - the new Badge ID will appear in the Achievement Editor after uploading it. - both values can also be captured from the web site, but you have to copy the image links as the hover link is for the achievement. Here is a perfect example of how to properly back up changed Badges. They are stored on site in the following manner and place: i.retroachievements.org/Badge/00136.png; the number coincidences with the badge ID found in the Achievement. The actual images are not being resized. The image is scaled by the browser to the display size. Some browsers such as Android's browser will display larger images more clearly. You can also increase your browser zoom to see them more clearly. It's anticipated that in a future website version, Icons and Badges will be displayed at full size in other places. [2019-02-04 03:47] televandalist: Typo - "retain it's original size" - changed to "retain its original size"
[2019-02-04 03:43] televandalist: Typo - "Badge create tips" changed to "Badge creation tips"